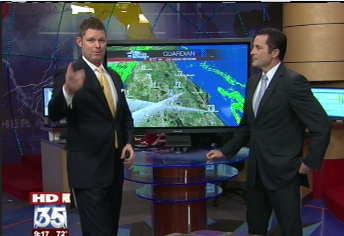 Jim Van Fleet and anchor John Brown chat during the meteorologist's last newscast for Fox 35 Monday. Another familiar face in the mornings at Fox 35 is leaving town, too. Mike Dunston is heading to Cleveland to anchor “Good Morning Cleveland” for WEWS-ABC 5. Dunston has been with WOFL since 2007. He’ll join his new station in December.